Fairmont Hotels & Resorts today announced that it has achieved World Wildlife Fund (WWF) Climate Savers Program targets, reducing its operational CO2 emissions by 20 per cent below 2006 levels. In doing so, the luxury hotel brand known for its industry leading sustainability programming becomes the first hotel brand and Canadian-based company to meet this ambitious environmental goal. WWF's Climate Savers Program was designed to inspire companies to change their thinking about climate solutions, while also encouraging them to transform themselves into low-carbon leaders. This leaves member companies better placed to avoid carbon-related risks while realizing opportunities within their long-term business strategies. Fairmont joined Fortune 500 companies and other top businesses like The Coca-Cola Company, Johnson & Johnson, and Nike to develop practical, cost-effective strategies that reduce emissions of CO2 and achieve energy efficiency solutions. "According to the United Nations, emissions generated directly from the tourism sector account today for 5 per cent of global CO2 emissions but may be higher. When Fairmont joined WWF's Climate Savers Program in 2009, our mandate was to help address this issue as part of our long standing commitment to sustainability," said Jane Mackie, vice president, Fairmont Brand. "Achieving this goal is a testament to our colleagues' commitment to their local communities. Thanks to their hard work, and through the purchase of Renewable Energy Certificates, we have removed as much CO2 as is generated by 13,569 passenger vehicles." Since its founding over a century ago, Fairmont has worked to deepen its connection to the environment and communities where it conducts business. This mindset led to the launch of the highly acclaimed and industry-leading Green Partnership Program, now known as the Fairmont Sustainability Partnership, a comprehensive approach to reducing the company's impact on the environment, and to the brand embracing the Climate Savers Program. "Leading companies like Fairmont are proving that strong environmental action leads to business success," said David Miller, President and CEO, WWF-Canada. "Successful actions like these are critical to mitigating the devastating impacts of climate change on people and nature." Created and implemented a Green Procurement Policy and Supplier Code of Conduct. Educated and encouraged top suppliers (representing approximately 25 per cent of the supply chain) to provide products in accordance with the Green Procurement Policy and Supplier Code of Conduct. Updated Design and Construction standards to incorporate and reflect Leadership in Energy & Environmental Design (LEED) standards. Fairmont hotels around the world also took their own unique approach to the challenge of reducing the brand's carbon footprint, upgrading infrastructure and changing behaviours to reach the company's goal. Activities were often driven by the actions of dedicated and passionate colleagues who were, and continue to be, committed to protecting and preserving the environment. Colleagues organized Sustainability Teams, leading the process as proactive, engaged, partners in the program. At the Fairmont St. Andrews, for example, the colleague Sustainability Team hosted open debates and pushed colleagues to propose initiatives that their department could then implement to create savings. At Fairmont Le Montreux Palace pumping water from Lake Geneva saves more than 60% of annual electricity consumption, compared to a standard air-conditioning installation (340'000 kwh/year). 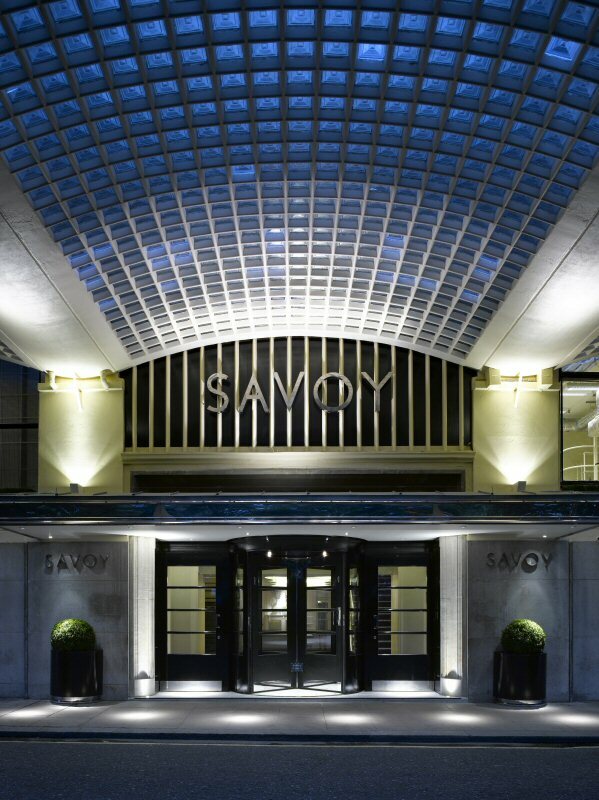 In London, The Savoy, A Fairmont Managed Hotel, installed a centralized compressor plant for all kitchen walk-in fridges and freezers. The hotel's refrigeration plant reclaims waste-heat to preheat domestic hot water by 5 degrees Celsius. Reclaiming waste heat produces an approximate saving of £38,500 over the course of the year, and reduces the loading and firing rate of the boilers which also extends the expected life of the boiler and reduces maintenance costs. Using outside breezes instead of air conditioning to circulate cold air into the Fairmont Dubai during the winter. This reduced energy consumption without impacting guest comfort. Fairmont Orchid, Hawaii heats its pool using waste heat from a chiller system at no cost. If the hotel were to heat its pool using conventional heating methods (like propane) it would cost more than $90,000 per year. The Fairmont Orchid, Hawaii is now examining the potential to apply solar films on windows and panels on the roof of the hotel to generate more of its power from a more sustainable source. In the heart of the Canadian Rockies, the Fairmont Banff Springs began utilizing outdoor ambient temperatures for its chilled water system. It estimates that this will save approximately 368,750 kWh of energy consumption annually. At Fairmont Singapore, the in-house Sustainability Team conducts monthly audits of offices, kitchens, and rooms to ensure energy efficient practices. "Fairmont was very motivated through our partnership with WWF to help tackle climate change, achieve significant CO2 reductions and deliver results worldwide," said Allison Long, Fairmont's business analyst, environmental affairs. "We are pleased with the results achieved thanks to our dedicated colleagues and are excited to be the first luxury hotel brand and only Canadian-based company to reach the Climate Savers Program targets." Fairmont Hotels & Resorts is a leader in sustainability and was one of the world's first hotel companies to embrace environmental stewardship. The luxury hotel brand has expanded this commitment to include economic, environmental, and social programming through its Fairmont Sustainability Partnership. With the goal of improving the overall well-being of local communities where Fairmont does business, the program focuses on four key areas to achieve change; responsible business, ecosystem, environment and engagement. Building on the brand's environmental platform, once lauded by National Geographic Traveler as "the most comprehensive environmental program in the North American hotel industry," ongoing global initiatives include reductions in energy and water consumption, waste generation and carbon emissions. Additional support includes sustainable practices related to design, proactive construction and procurement policies, as well as community outreach through local groups and partnerships. As the first luxury hotel group to address climate change, Fairmont also worked with the WWF in achieving established greenhouse gas emission reduction targets, among other strategic initiatives. Fairmont Hotels & Resorts connects guests to the very best of its destinations worldwide, reflecting each locale's energy, culture and history. Passionate travelers choose the luxury hotel brand for its ability to deliver memorable travel experiences, personalized and thoughtful service, and hotels that are one-of-a-kind. Serving as genuine gateways to their destinations, Fairmont hotels offer locally-inspired cuisine and spirited bars and lounges, distinctive design and décor, and a steadfast responsibility to environmental and social priorities. With more than 65 hotels globally, and many more in development, landmark hotels in the Fairmont collection include The Plaza in New York, London's The Savoy, Fairmont Peace Hotel in Shanghai and Quebec City's Fairmont Le Château Frontenac. Fairmont is owned by FRHI Hotels & Resorts, a leading global hotel company with over 110 hotels under the Fairmont, Raffles, and Swissôtel brands. The company also manages Fairmont, Raffles and Swissôtel branded luxury private residence clubs, whole-ownership residences and serviced residences properties. For more information or reservations, please visit fairmont.com. WWF-Canada is part of WWF (World Wildlife Fund), the global conservation organization. With the active support of over 150,000 Canadians, WWF is Canada's largest conservation organization. WWF is creating solutions to the most serious conservation challenges facing our planet, helping people and nature thrive. www.wwf.ca. In London, The Savoy, A Fairmont Managed Hotel established itself as one of the greenest hotels in the city by adding new energy efficient boilers, smart meters, and a waste management system that recycles up to 90 per cent of the property's waste and converts it into an energy source. The iconic hotel also installed a centralized compressor plant for all kitchen walk-in fridges and freezers, which reclaims waste-heat and produces savings of GBP 38,500 annually.